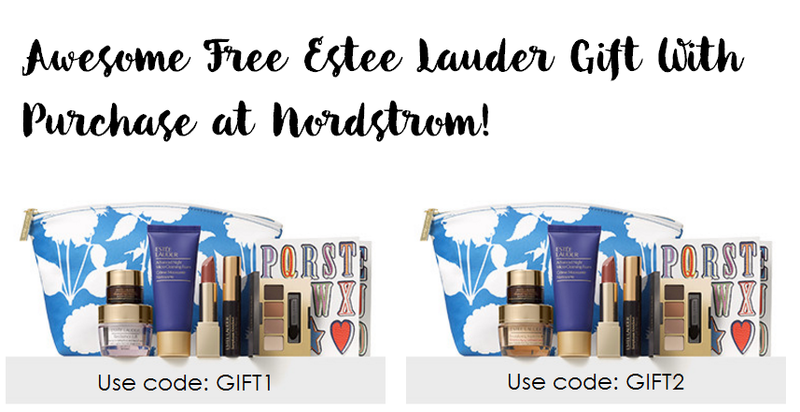 There’s an awesome new Estee Lauder free gift with purchase going on at Nordstrom right now. Online and in stores. This one comes in several parts. First, is a 7-piece gift bag with $35 purchase. You have the choice of GIFT1 or GIFT2 and you’ll enter one of those codes at checkout to choose. There’s also a few unadvertised gifts that appear in checkout! You’ll also receive deluxe samples of Sumptuous Infinite Daring Length & Volume Mascara (0.1 oz.) and New Dimension Shape + Fill Expert Serum (0.24 oz.) with your $35 Estée Lauder purchase. Online only. Spend $75 on Estée Lauder and also receive a gift of Advanced Night Repair Intensive Recovery Ampoules (10 capsules), Micro Essence Skin Activating Treatment Lotion (1.7 oz.) and Advanced Night Repair Serum (0.5 oz.). Up to $240 combined value. Online and in U.S. stores; in-store offer may vary. Receive deluxe samples of Re-Nutriv Ultimate Lift Regenerating Youth Eye Creme (0.24 oz. ), Re-Nutriv Ultimate Lift Regenerating Youth Creme (0.5 oz.) and Re-Nutriv Hydrating Creme Cleanser (1 oz.) with your $100 Estée Lauder purchase. A $175 value. Online and in U.S. stores. Spend a total of $100 and also get a full-size Nutritious 2-in-1 Foam Cleanser. Up to $270 combined value. Online and in U.S. stores; in-store offer may vary. Check out this screenshot of my cart when I added the 2-pack of Advance Night Repair ($165).